Angry Asian Buddhist: What do you know about the Pure Land? What do you know about the Pure Land? I am not a Pure Land Buddhist. My familiarity with Pure Land Buddhist traditions is rather limited, but I know enough to know that Douglas Todd’s Vancouver Sun article on Buddhism in Canada (“As Buddhism grows, two ‘solitudes’ emerge”) distorts the tradition to the point of stereotype. Todd depicts Pure Land Buddhism in Vancouver as a bunch of Asian Buddhist immigrants who don’t speak English and whose superstition-dominated spirituality consists of liturgical appeals to be reborn in a Buddhist heaven. Pure Land is one tradition among many within Mahayana Buddhism, such that most of Vancouver’s Chinese Buddhist temples practice Pure Land Buddhism alongside sutra study, meditation, community service and non-Pure Land recitation practice. It is a cavalier misrepresentation of these temples’ Buddhist traditions for Todd to reduce all they do to the pursuit of a heavenly rebirth. Even Jodo Shinshu Buddhists, who focus more exclusively on Pure Land philosophy, aren’t just sitting around praying to be saved. Take a look, for example, at Dharma Realm Buddhist Association, the organization of Ven. Heng Jung, who was the only Asian Buddhist whom Todd quoted. It’s more than just Pure Land. You will find Pure Land Buddhism practiced alongside scholarship, meditation, recitation and much more. Online, you can read the Dharma Forest blog and watch videos of Ven. 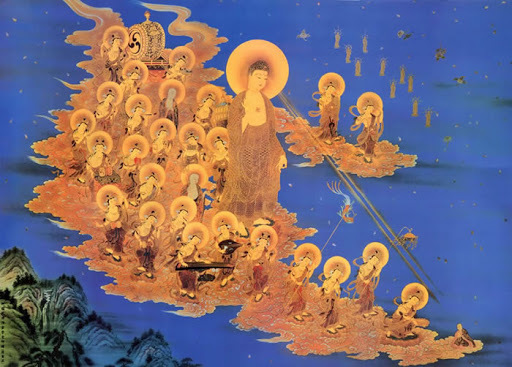 Heng Sure, where you will find quite a bit more than repetitions of “Amitabha.” You could also check out the dharmas blog of Dharma Realm Buddhist University, where the vast majority of posts appear to be on subjects unrelated to the Pure Land. Note that none of the individuals mentioned here who follow Pure Land Buddhism are Asian Buddhist immigrants who don’t speak English—many are, in fact, Western converts. While I have no doubt that there are Buddhists in Vancouver who will readily identify as Pure Land Buddhists and others who avow a yearning for rebirth in the Pure Land, for at least as many the Pure Land tradition is just one in a knapsack of Mahayana Buddhist traditions that an individual may practice. The Pure Land “practice” itself varies, just as practitioners have different perspectives on what the “Pure Land” actually is. You can learn more about Pure Land Buddhism by following the links above—I am by far no authority on this subject—however, from Todd’s article in the Vancouver Sun, you will find a stereotypical perspective of the type that Pure Land detractors would promote. Yeah, what you said. :-) Seriously, there's Pure Land and there's Pure Land and there's...there's Vietnamese Pure Land, Chinese Pure Land, Japanese, etc. The Chinese "Pure Land" (via the mainland) owes a big debt to Ch'an master Hsu Yun, and there seems to be a similar strain with at least some Vietnamese sanghas from those I've visited. Then there's the Japanese, at least as there are in the US, which sought to emulate bits of Christianity, and in which, in the US, nissei, sansei, etc. (2nd, 3rd, etc. generations) of US citizens are members, and I'd bet it's the same thing in BC. Oh, I forgot to add: the Chinese Pure Land via Taiwan is different again...and although mainland Pure Land owes a lot to Hsu Yun, there ARE Pure Land - only temples in China, just as there are " primarily Ch'an" temples in China. Pure Land may arguably be the largest school of BuddhaDharma, in the world and in the West, but in the West the least understood outside its temples. As yet. Would be curious what if anything Mr Todd writes in response. Thank you for the writing. Thanks for this. Just a note: Jodo Shinshu thought (as I understand it, very imperfectly) explicitly rejects the idea that chanting is a means of obtaining birth in the Pure Land. "Namu Amida Butsu" is an expression of trust in and gratitude for what is already given. And the trust and gratitude are also gifts, not something we produce. The mind of trust and gratitude IS the Pure Land. As someone who practices at a Pure Land Zendo (Cloud Water Zendo), I thank you for getting the word out about the misconceptions of Pure Land. It is one thing to deal with it within the Buddhist community, it is another when it is misunderstood in general society. Most of the buddhist sutras and teachings in Pure Land Buddhism are based on the Amitabha Buddha. It is even said that if Amitabha Buddha hadn't taken the transcendent vows, the Buddhism we know now wouldn't even existed. I think one consideration is to come to a definition as to what is Amida Buddha. I have my opinion but I prefer to hear from other Pure Land Buddhists.